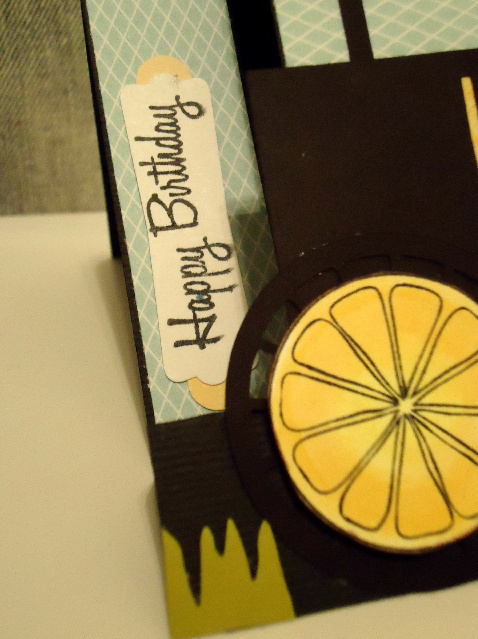 The Rubber Cafe Design Team Blog: Citrus Greetings and Amazing Folds! Citrus Greetings and Amazing Folds! I've had this Fruit Medley set for awhile and I'm finally getting a chance to play around with it, and having fun coming up with some 'alternative' ways to show off these fun fruity images and greetings! First, I have another swing card, like the one I shared with you on the 4th of July! I told you this card fold was addicting! 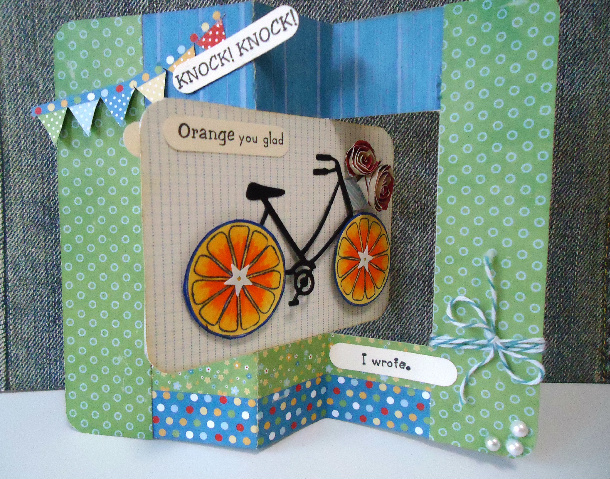 This time I've used a new bicycle die I just bought along with the orange slices and 'Knock, Knock' sentiments. 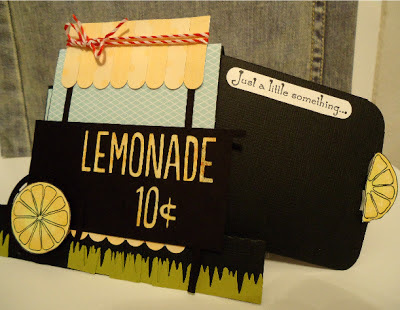 I used my window punch from Stampin'UP! to cut out the fun Knock! Knock! questions and answers. On the flip side I rolled some paper roses to put into my bike basket. Next up - I created a fun Lemon-aide stand that is also a fun amazing fold, as well as a gift card. 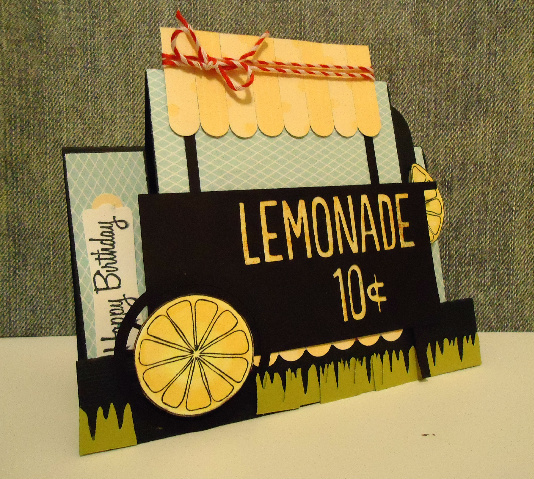 I cut the card base and the base of the cart using my Cameo diecut machine, but this card base is much like a step card fold and could just as easily be scored and cut by using your trimmer and /or ScorePal. The awning is punched again using my Window punch from Stampin'UP!- and the wheel is a lemon slice, and I stamped the "Happy Birthday" phrase- and placed it in the side step on the left hand side. I wish I'd pushed it up a little higher, as I was photographing this card I noticed it was getting covered a bit from the wheel. 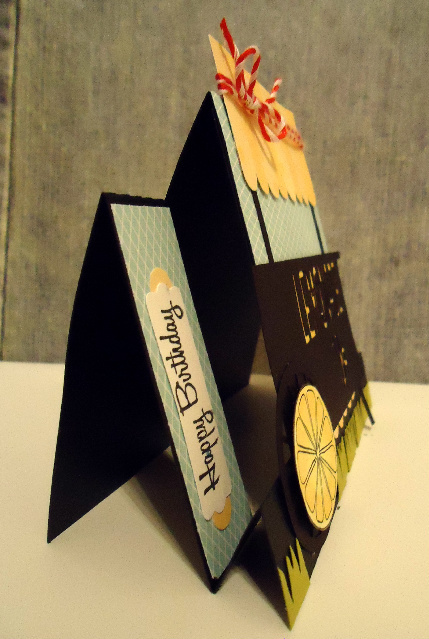 Here's a close-up view of the side you can see the front of the card is like the first step and the side panels become the second step. 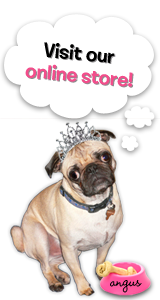 Behind the front step, there is a place for a gift card. 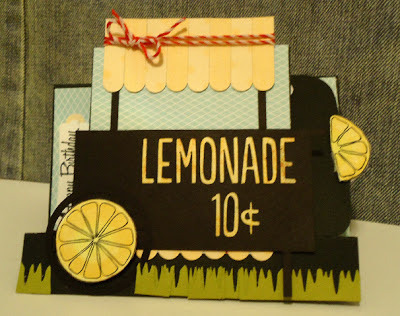 Pull on the 1/2 lemon slice and there it is! I've included the "Just a little something..." phrase also from the Fruit Medley set. Here's one more look. I finished it off at the bottom with some grass I punched, and Red/White bakers' twine finishes off the top! I love baker's twine, and I seem to find someplace for it in most every card I make these days! 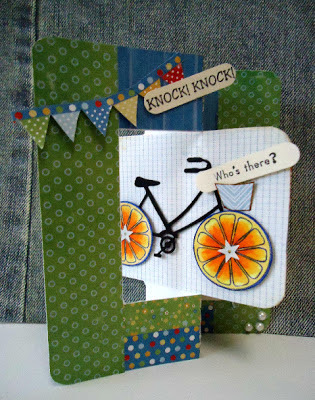 Karen....these are so fun....love the way you used the Fruit Medley set!